I have something very special to share with you today. 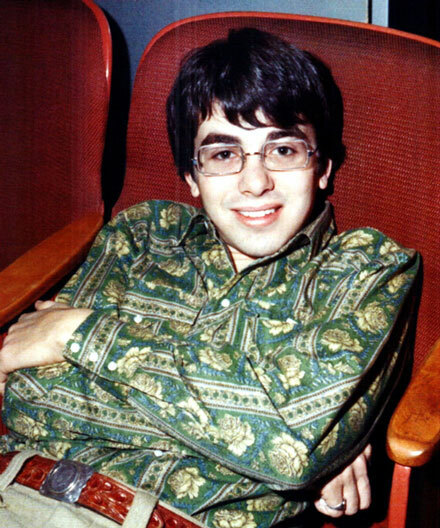 As has been written in ths space before, I am a big fan of Van Dyke Parks, as an artist and in his capacity as a arranger/muse/facilitator for other artists. Parks is best known for his collaboration with Brian Wilson on the ‘Smile’ LP, in both its aborted beginnings and it’s coming to fruition decades later. During the 1960s he worked with Wilson and the Beach Boys, Randy Newman, Nilsson, Ruthann Friedman, Phil Ochs, Tim Buckley and many more. The term ‘Americana’ has come over the years to represent a dose of rural/country sounds in music, but with Parks it means something much bigger. While he is best known for his contributions to 60s and 70s pop, and he worked well within the stylistic framework of that era, he also brought with him the sounds of popular music, beginning with the days of Stephen Foster and moving on up through ragtime, Tin Pan Alley and into the years of vinyl. While it seems – in hindsight – a remarkable achievement I am of the opinion that it was this quality that kept Parks on the exotic end of the menu throughout his long career. It is possible that time will show that Parks importance lay in his work as a partner/facilitator, but that would be a shame, considering how good his own work is. I can’t be sure where the song ‘Come to the Sunshine’ first entered my ears. It’s likely that I read about the Harpers Bizarre hit (Top 40 6/67) but I don’t think I actually heard the song until I picked up a 45 with a version of it by a country/pop singer named Roberta Lee (with a Link Wray cover on the flip). Lee’s version stripped some of the wonder out of the song, making it sound like a Florida Department of tourism commercial. I finally encountered Van Dyke Parks’ original version (albeit a badly mixed/mastered one) on a late-60s MGM sampler called ‘The Core of Rock’. It wasn’t until the Rhino ‘Where the Action Is’ box set that I finally heard a nice, clear take on Parks recording. Not long after that, I set out in search of the 45, which took the better part of a year. That 45, recorded in 1966 by Parks, and featuring a dense, heavily layered arrangement, is a sunny, yet complex pop experience. The record doesn’t really evoke a specific sound (you get alternating strata of piano, mandolin and rhythm section, all with Parks’ high tenor running over it) aiming more at a mood of sunny (what else?) optimism. He even manages to namecheck his father’s dance band (the White Swan Serenaders) in the lyrics! Interestingly, for all the layers, the record was apparently recorded in three takes on a single day. The Harpers Bizarre version of ‘Come To the Sunshine’ (which features VDP in keyboards) brings some of the hazier parts of Parks recording into sharp focus, which is not necessarily a good thing, since the end result is a good deal slicker than the original. The flipside of ‘Come to the Sunshine’ is a fairly straight reading of the country gospel tune ‘Farther Along’, which was also recorded by the Byrds a few years later on the album of the same name. 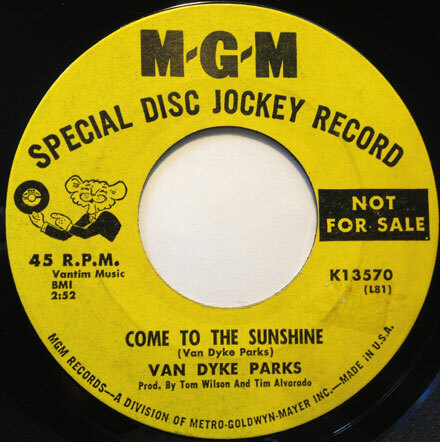 ‘Come to the Sunshine’ was also covered by the Marketts, the Pleasure Fair, and a UK group called the Chuckles. Though I’m sure it has come up in conversation here over the years, I should take a moment to reiterate the powerful impact that the music of the Velvet Underground had on me in the 80s. While I was by and large immersed in the sounds of 60s garage, beat and psych, thanks to some slightly older/wiser folks in the NJ fanzine mafia, the Velvets entered my ears, rewired my head and never left. This had a lot to do with the fact that by 1982, he influence of the VU (still largely unknown to us as anything but a line in Lou Reed’s CV) started to bubble up to the surface in the sounds of the blooming alternative culture, indirectly in the sounds that the new bands made, and directly by being namechecked in interviews and reviews. I had already heard and dug a number of VU songs via Lou Reed’s ‘Rock and Roll Animal’ (a major spin with the high school heads) and Mitch Ryder and Detroit’s rocking cover of ‘Rock and Roll’, which oddly enough was the jingle for our local drag strip (no kidding, really). When I finally put the pieces together and picked myself up copies of the first three VU albums – some reissues, some OG (which were easier to come by pre-interwebs) my brain was good and truly bent. Not only did the Velvets sound (and look, and act) WAY ahead of their time, but the songs and performances ran the gamut from pop perfection to spellbinding avalanches of noise. I finally came upon ‘Loaded’ fairly late in the game. There are probably people out there who discount ‘Loaded’ because it lacks some of the NYC downtown grit/menace of the Verve albums, but they either haven’t really listened to the record, or did and missed the point. There aren’t any blazing noise-fests on ‘Loaded’, but there weren’t on ‘The Velvet Underground’ (the first lp with Doug Yule) either. ‘Loaded’ may be a touch more lighthearted (just a touch, mind you…) or, dare I say, optimistic, but tonally the albums are texturally very similar, with all of the group’s earlier artsy confrontation removed and replaced with melancholic reflection. The tune I bring you today is the only 45 released from ‘Loaded’ here in the US, and it’s a promo at that. There were two other singles released from ‘Loaded’ but they were only issued in the UK & Germany (Sweet Jane b/w Rock and Roll) and France (Head Held High b/w Train Round the Bend). 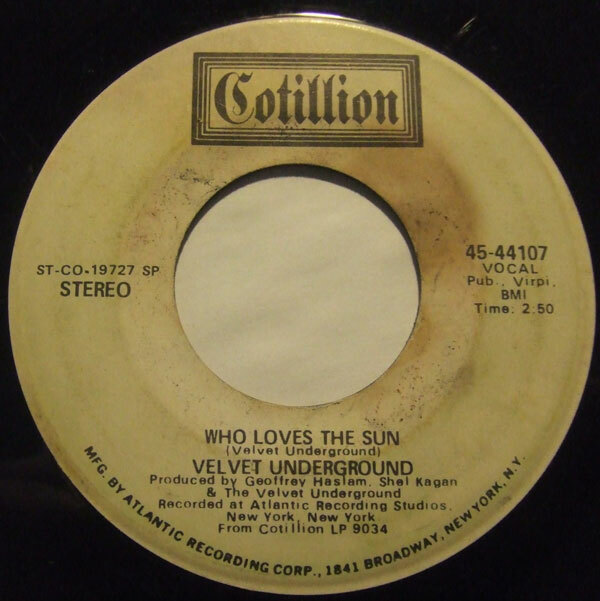 ‘Who Loves the Sun’, with authorship credited to the band and lead vocals by Doug Yule is the closest thing to an upbeat pop song that the VU ever laid down. There are moments, especially when the group harmonies come in on the ‘bah bah bahhhh’ section of the chorus where you might be forgiven for thinking you were listening to another band entirely. 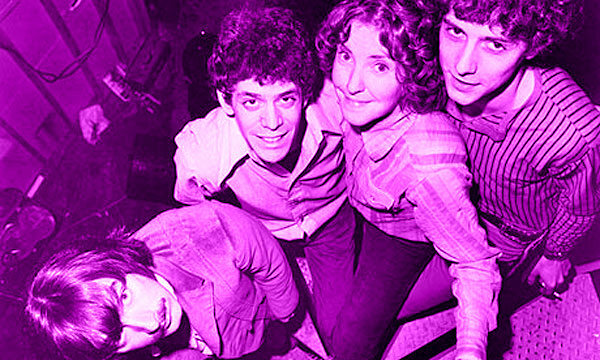 There might be a lot of daylight between something like ‘European Son’ and ‘Who Loves the Sun’, but by 1970 the Velvet Underground were a very different band, and the song sounds of a piece with the rest of the album. Producer Geoff Haslam would go on the following year to produce the MC5’s final album ‘High Time’. It is a very groovy song indeed, and if you haven’t explored the later end of the VU discography, I would suggest you do so, since there is a lot to dig. I hope you like the song, and I’ll see you all next week. This month should be an especially good episode since it is composed almost entirely of recently excavated new arrivals. I was lucky enough to get in a couple of digging sessions on a recent vacation and came away with a nice fat stack of 45s and some very cool LPs as well. I even have some stuff left over for next month! There some cool sunshine pop, popsike, garage and pure pop, all very groovy and guaranteed to keep your ears tingling. As always, I hope you dig it and I’ll see you all next week. I thought I’d bring you something this week in which you might soak your ears. 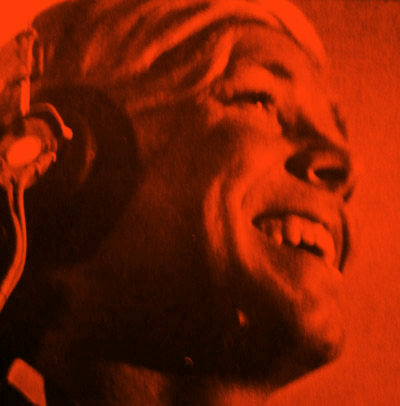 A while back, I was taking myself a a stroll through a recently discovered Discogs store on-line, and grabbed a bunch of interesting looking (and best of all, CHEAP) stuff. One of the discs I procured you see before you today, the throbbing Moog-fest known as ‘Electric Tommy’. If the title isn’t self-explanatory enough for you, it should suffice to say that what you have here is a synthesized take on the tunes from the Who’s ‘Tommy’. 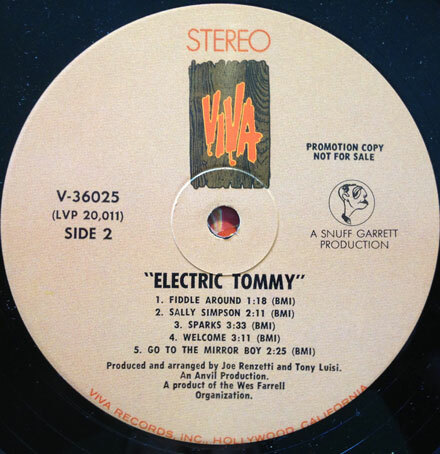 Brought to you by well-known Philly composer/arranger/guitarist Joe Renzetti, and keyboardist Tony Luisi, ‘Electric Tommy’ was recorded and released in 1971 on Snuff Garrett’s Viva label. 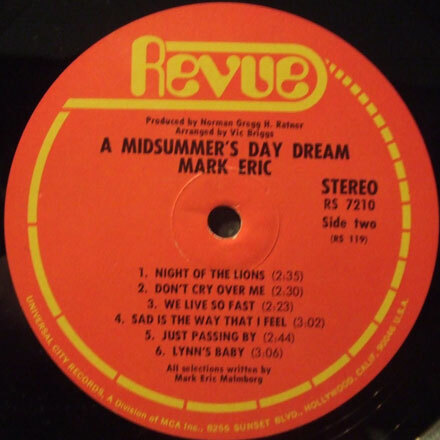 As mentioned in this space before, while I’m not a Moog fanatic, I am always on the lookout for records like this, since when they are done well they are quite groovy, and when they are done not-so-well, they are still worth listening to, if only for comic relief. Fortunately, ‘Electric Tommy’ is actually pretty cool. 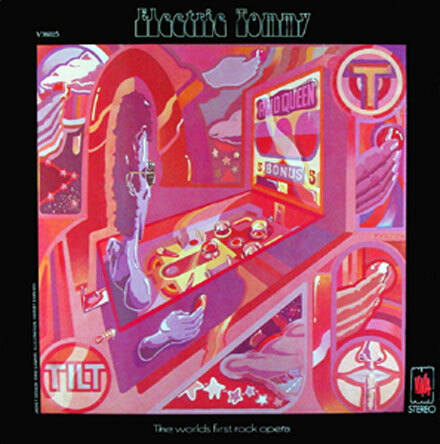 The two tracks I bring you today are synthesizer versions of my two favorite tunes from ‘Tommy’, ‘Amazing Journey’ and ‘Sparks’, which also happen to run together on the original LP. Though I dig the Who very much, I still have a hard time grappling with any rock musician willing calling anything they’ve done an “opera”. Call it a suite, a song cycle, even a musical, but going from ‘I hope I die before I get old’ to “here’s my opera” in the space of a few short years is a little much. That said, there were a lot good songs (some great) in ‘Tommy’, and for a variety of reasons – foremost their melodies – these two songs hold up quite well to this kind of treatment. Some of the success has to do with the way the syths are used, i.e. more musically and less as a novelty, and Renzetti and Luisi were up to the task. This is “head” music, in all senses of the word. It should fit well should you become intoxicated and wish to feed something through your earholes into your cranium. There are enough swoops and swishes, wrapped in and around Townshend’s melodies to take your brain for a ride. I would suggest listening to these tracks, especially ‘Sparks’ at fairly high volume to get the full effect. Renzetti and Luisi manage to approximate the power and texture of the rhythm guitar as well as finding some musicality in the sythesizers that many of their contemporaries could not. Nothing earthshaking, but an interesting listen nonetheless. I hope you dig it, and I’ll see you all next week with a new episode of the Iron Leg Radio Show.